My son, who is 11, says that since butter is made from milk, it should be counted as a dairy food. I know that it’s not dairy, but can you help me explain why? The most important nutrient we get from dairy foods is calcium. 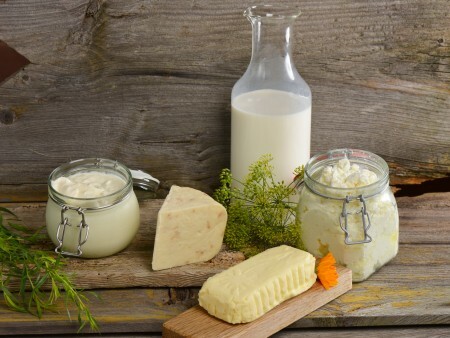 Some foods made from milk, such as cheese and yogurt, retain their calcium content, and those foods are counted along with milk as part of the dairy group. Ice cream and frozen yogurt are counted in the dairy group, but they also can be high in calories, saturated fat and added sugars. Choosing low-fat or fat-free types would be healthier choices for dairy-based desserts. What nutrient can you get from eating whole fruit but usually not from fruit juice? What protein food is also a good source of calcium? About how much of the grains you eat should be whole grains? How much of your plate should be filled with vegetables and fruit? What is the name of the sugar found naturally in milk? What vitamin gives carrots their orange color? Printable MyPlate Daily Checklists for different calorie levels (and an easy way to find out how many calories you should be eating each day). The online SuperTracker, which can help you plan and track your diet and physical activity. The “What’s Cooking? USDA Mixing Bowl” site, which helps you build healthy menus, browse recipes, watch how-to cooking videos and create and print your own cookbook. The ChooseMyPlate.gov site provides a wealth of information about healthy eating at your fingertips. Bon appetit! Editor: This column was reviewed by Carolyn Gunther, Community Nutrition specialist for Ohio State University Extension.